Molly and I are Writer’s Workshop teachers. We have both taken the Writer’s Workshop training at Teacher’s College (TC) and both of us feel passionately about our students seeing themselves as writers. When we began our 1:1 journey, the possibilities did and still do feel endless with our devices, however, sometimes this endlessness can be daunting. 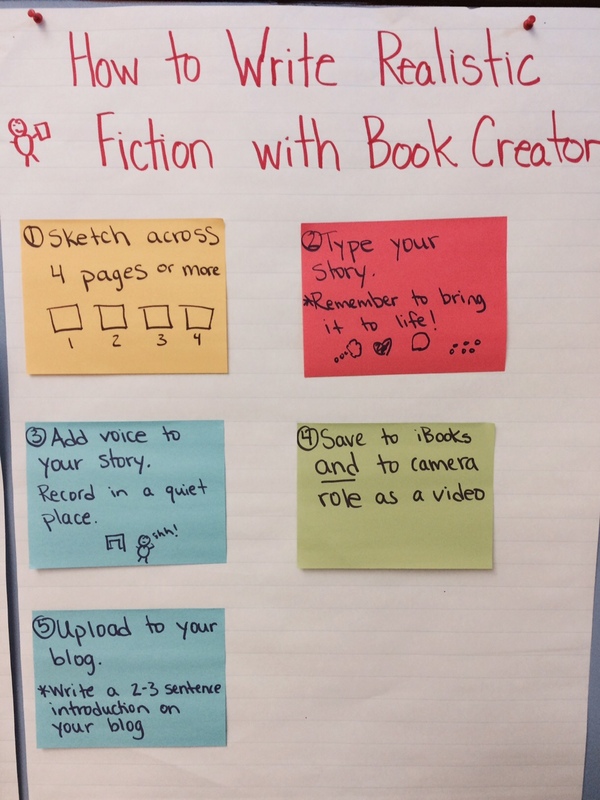 I’ve written about how we use both Educreations and Book Creator in our classrooms (Book Creator and Educreations in the classroom), in this post I want to focus specifically how we use Book Creator in conjunction with our Writer’s Workshop. We do three-four writing units a year based on the TC first grade Writer’s Workshop curriculum. During our daily Writer’s Workshop, students spend around 30-40 minutes writing and editing. This past year I focused on using BookCreator during the informational writing unit and realistic fiction(2nd and 3rd units). I plan to integrate Book Creator into the small moments (1st unit) curriculum this coming year because it was incredibly engaging to students and allowed them to easily publish their work digitally. There are a many ways to use Book Creator during the workshop. Sometimes students would publish books they had already written using Book Creator. This was exciting to them because not only did they have a paper copy but they also had a copy they could read and access through iBooks on their iPad. This also made it easy to share their writing through their kidblog as you can save books on Book Creator as a video on the camera roll and upload to a variety of platforms. They also were able to Airdrop their stories to each other’s iPads and create a class library filled with their peers stories. What struck me about using Book Creator as a writing tool was how engaged and excited students were to use it even during free choice time. In this first sample, the student wrote about how to care for the classroom fish using skills the student learned during the workshop however, the student wrote the story during free choice. The skills the student was learning in writing naturally transfer to using the Book Creator app. In this second example, we had been writing realistic fiction series for several weeks when we decided to use Book Creator to write and publish one of the stories in the series. I created a anchor chart to guide students through the process. Using Book Creator in our Writer’s Workshop allowed our students to create and publish their stories digitally, share their work easily on their blog and apply writing skills they had learned in the workshop to a digital medium. I cannot recommend using Book Creator in conjunction with your Writer’s Workshop enough!